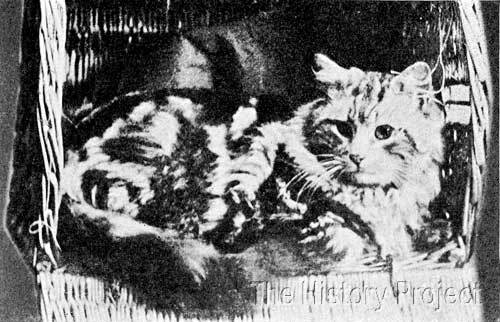 Dubbed by author Helen M. Winslow as 'the Best Long-haired Silver Tabby in England'1, 'Champion Topso of Dingley' stands at the very apex of a long family tree of famous Silver Tabby Longhairs, a number of whom have made a significant contribution to the history of Silver Tabbies both in the United Kingdom and the United States. He also features on the pedigrees of a good number of chinchilla cats, which have likewise been bred from his descendants, duly mixed with the offspring from other Silver Persian bloodlines. But his successes and those of many his offspring were due in the main to the untiring efforts of his devoted owner and admirer, Miss S. Anderson-Leake. It is acknowledged by Frances Simpson, that Silver Tabbies were the original root stock of all silvers, but that in the craze for breeding an unmarked silver cat, namely the Chinchilla,- that the silver tabbies of the day suffered materially. This appears to have begun with the appearance of 'Ch. Silver Lambkin' (born in 1889), sired by the Smoke 'Ch. Perso' and out of 'Beauty of Bridgeyate'(1885), a daughter of the appropriately named silver 'Chinnie'(1883). "The third in the group of silvers, is the silver tabby. The points are here stated: The (Ground*) colour of a silver tabby should be pale, clear silver, with distinct black markings. (*Editor) This variety, ought in equity to have been mentioned first, as it is the original stock, but it has been overshadowed by the superior attractions of the chinchilla. (Silver tabby enthusiasts will perhaps pardon this eulogy of my favourite breed). There is not the slightest doubt this handsome cat, the silver tabby, has suffered materially from the craze for the newer variety, and consequently the type has not been kept pure. They have been bred over and over again with cats of less markings in the hope of breeding chinchillas, until at the present day there are very few silver tabbies true to type. 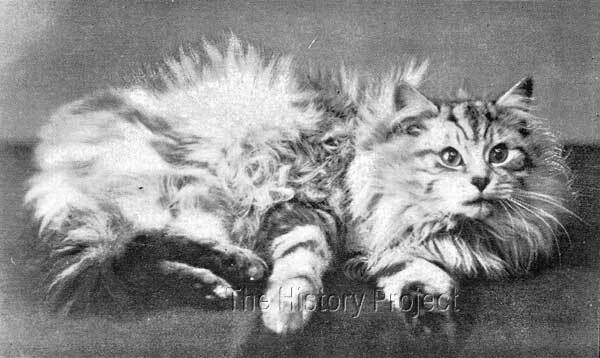 'Topso', who was born at some time in May 1886, can claim the singular distinction of being the 1000th cat to be registered by The National Cat Club, whose registration numbering began with 1001, with 'Topso' gaining the spot with '2000'. His entry is given with 'Sire' and 'Dam' as unknown. No breeder is listed and his owner is recorded as Miss S. Anderson Leake, Dingley Hill, Bradford, near Reading. "Competent judges agree that to breed regular, symmetrical, and well-coloured markings is no easy task, for contrast is the grand point in a silver tabby. His ground coat, from tip to tail should be pure pale white silver. On this light silver ground-work lie the most beautiful even dark mottlings, dark to the point of blackness. These markings are most difficult to describe. A dark stripe runs the whole length of the spine. Then comes a light stripe on either side, then two more dark stripes, but these are broken just behind the shoulder by a transverse bar of light silver, and widen on the shoulder into considerable sized patches. The markings on the sides are not stripes, but patches, elliptical in shape, generally three in number, and partially encircles by dark stripes. He shoulder is particularly heavily barred and striped, as are also the hind quarters. The legs are barred throughout their length, the face should be dark, with dark tufts, and the back part of the hind legs from the knee downward is black, (The hocks* Ed.) as in a Southdown Sheep. "The head is most beautifully pencilled, the cheeks possess double or triple swirls, the eyes are outlined by dark rims; on the forehead the lines form a complete triangle, which is repeated at the nape of the neck. The chest is encircled with a perfect dark ring, called 'The Lord Mayor's chain', but this is concealed when the large light frill is in full beauty, as is also the neck triangle. The whiskers often contain all the different shades of colour found in the coat. The ear tufts should be long and light. The tail is generally ringed from trunk to tip, but this is not noticeable after kittenhood, owing to the great length of the hair. Also, the hair to the root is much darker on the tail than on the body. "Not only evenness and regularity of markings go to the making of a good tabby, but sharpness and depth of colour in the dark parts, and clearness of colour in the light parts. A great deal has been said of late regarding the depth of the black markings; but it is quite as necessary to insist on the purity of the silver tone. No suspicion of brown must be tolerated, neither any blue or grey tone. Out of 'Lady Pink'.Probable full sibling to 'Sultan of Dingley'. Bred by Mrs. Marriott, owned by Miss Moore. 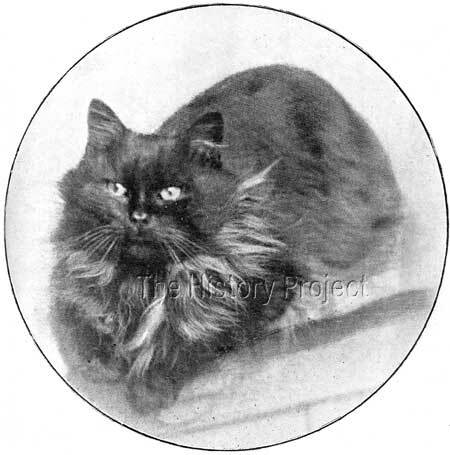 By far the most noted son of 'Champion Topso' and a prime progenitor of many famous Silver Tabbies, among them being his sons: 'Felix Mottisfont' , bred by Miss Jevons and owned by Miss S. Freeland; and 'Abdul Zaphir of Dingley', bred by Miss Anderson Leake, and originally owned by Mrs. Shelley but later returning to Miss Leake. Among his prominent daughters, 'Miss Fluffie of Dingley' (whose dam was 'Brookville Fluffie'), sired by 'Ch. Silver Lambkin', 'Miss Fluffie' was bred by Mrs. Robinson; and 'True Love of Dingley' bred by Mrs. Turner, out of 'Sunshine' and owned by Miss A. Leake. 'Miss Fluffie' went on to be the dam of many more famous 'Dingley' cats, all sired by 'Abdul Hamet of Dingley'. Another silver tabby grandson was 'Aramis', sired by 'Felix Mottisfont', bred by Miss Freeland and owned by Mrs. Frank Worthington. 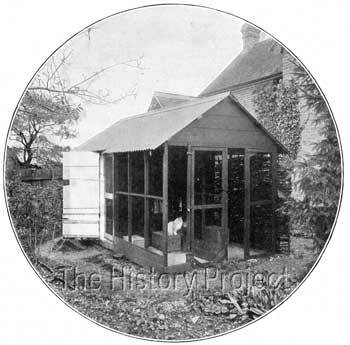 Among prominent granddaughters, were 'New Forest Fairy' by 'Felix Mottisfont', bred by Miss Freeland and owned by Miss Hester Cochran; then later by Mrs. White Atkins. And 'Argent Dainty', by Ch. Adbul Zaphir of Dingley, bred by Miss Anderson Leake, originally owned by Mrs. Lely, but eventually owned by Mrs. Champion. Bred and owned by Miss S. Anderson Leake. Out of 'Lady Pink' NCC:1990 so a possible older full sibling to 'Sultan of Dingley'. Bred by Mr Townsend, and owned by Miss Hester Cochran. Bred by Mrs. Marriott, and owned by Miss S. Anderson Leake. Bred by Miss Anderson Leake and owned by F.P. Knight. Bred by Miss S. Anderson Leake, and owned by Mrs. Knight, of Southgate, Bath. Out of 'Mimidatyie'. (by Blue Boy the Great ex Boots). Bred by Mrs. Gardiner, and owned by Miss S. Anderson Leake. Out of 'Oona of Dingley' (by Blue Jack ex Tersa). Bred by Miss S. Anderson Leake, and owned by Miss Power. 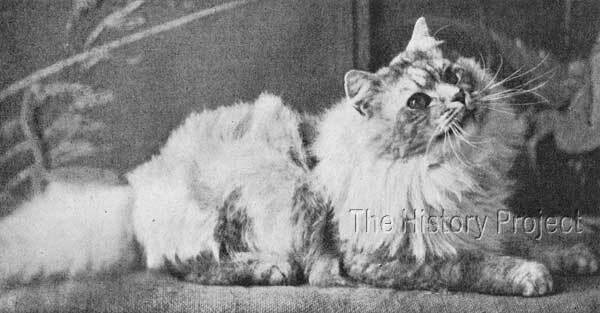 Dam of 'Watership Zelica', a silver tabby female born 2nd May, 1900, bred and owned by Miss Power, who also owned her sire, 'Abdul Zaphir' (a Grandson of 'Topso'). Later, Miss Fluffie would be line-bred to Topso's Great Grandson, 'Abdul Hamet of Dingley' a number of times, and this would produce 'The Marquis of Dingley', 'Zano', 'The Dingley Owlet','Dingley Fashion', and 'The Dingley Potentate'. 'LADY KITTY', presumed a Silver Tabby Female, date of birth unknown. By 'Topso' and out of 'Ouida of Dingley'. Bred by Miss Anderson Leake and owned by Mrs. A.W. Stevens. 'LOST', pattern unknown female, date of birth unknown. By 'Topso', and out of his grand-daughter, 'Roly Poly San', who was owned by Mrs. Davies. 'SHADY', styled as a Self-Silver female, date of birth unknown. By'Topso'. And out of 'Ouida of Dingley'. Sired by 'Ch. Felix', a son of 'Topso' and out of an unknown dam. A home-bred male owned by Miss Leake, who although the sire of other well-known cats, is chiefly noted as the sire of 'Abdul Hamet of Dingley', a fourth generation main-stay of the 'Dingley' cattery and the sire of a swathe of famous Silver Tabbies, among which may be counted: 'The Marquis of Dingley', 'Ch. Don Pedro of Thorpe', 'Roiall Starlet', 'Roiall Fluffball', 'Roiall Silver Butterfly', 'The Dingley Owlet', 'Dingley Fashion', 'The Dingley Potentate', 'Arlington Dingley Bar Abdul', 'Arlington Dingley Belle', 'Dunsden Abdul', 'Miss Hamet' and more. Great-Grandson, 'Abdul Hamet of Dingley', one of the most noted sires descended from 'Topso' and a leading stud in the 'Dingley' cattery strain. 'LORD ARGENT', Chinchilla male, born 22nd September, 1894. Sired by 'Ch. Silver Lambkin', and out of a daughter of 'Topso' named 'SYLVIA'. Bred by Miss Crompton Roberts and owned by Mrs. Champion. As a consequence, all of the numerous and noted progeny of 'Lord Argent' carry the lines of 'Topso' into a plethora of Chinchilla, Shaded Silver and Silver Tabby lines, all descended from this well-liked and sturdy Silver male, who was a foundation of the famous strain of 'Argent' silvers. Grandson, 'Lord Argent', (Chinchilla), by 'Ch. Silver Lambkin' but also descended via his dam from 'Topso of Dingley'. 'Lord Argent' is a leading foundation of the 'Argent' strain of Chinchillas. 'CH. RANJI', Black Smoke male, born October, 1897. Sired by 'Chin Chin', and out of 'Polly', a daughter of 'Topso'. 'Ranji' was bred by Mrs. Davies and owned by Mrs. A.M. Stead. Another Grandson, 'Ch. Ranji' (Black Smoke), sired by 'Chin Chin' but out of 'Polly', a daughter of 'Topso of Dingley'. The memorable 'Champion Topso of Dingley', born in May 1886. 'Topso' is one of the few foundation cats that can be traced across a myriad of cattery bloodlines, due to the contribution made by a number of his descendants into a wide variety breeding programs for Tabby, Silver Tabby, Shaded Silver, Chinchilla and Smoke Persians. This can largely be attributed to the wonderful work done by Miss Anderson Leake in establishing the 'Dingley' strain and then working hard to enhance and preserve it over a roughly twenty year period. Her bloodlines were duly magnified by the achievements of Miss Moore, with 'Ch. Felix', Miss Freeland, with 'Felix Mottisfont' and later, Miss Cope of 'Roiall' cattery, who was immensely faithful to the 'Dingley' strain in her own breeding , and whose cats were similarly disseminated into other catteries. 'Topso' like 'Chinnie' sits at the apex of his respective family tree, similarly a figurehead surrounded by the mystery of his origins and a testament to what one admiring person could achieve with copious amounts of love and determination.